Clearasil Ultra 5 in 1 Exfoliating Scrub Review! Even though I'm nearly 25, I still suffer with terrible oily skin and to be honest I was always under the impression that this would start to sort itself out after my terrible teenager years! Give me a break please! Over the years I've tried a handful of different products claiming to banish my spots and blackheads and even dull my shiny forehead but the percentage of these products actually working is unfortunately very low. After going through phases of trying every new product out and being so down and not using anything at all, I've decided to give it another go and try out new acne products! One of my main problems at the moment was my blackheads and their annoying ability to reappear no matter what I do so I was looking for something to mainly help combat this. 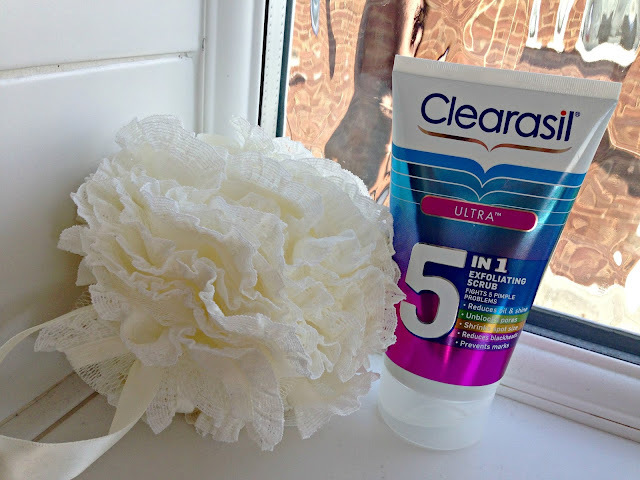 When I popped into my local Tesco I was overwhelmed with the choices and in the end I decided on the Clearasil Ultra 5 in 1 Exfoliating Face Scrub. I've used lots of different Clearasil products in the past and it's a brand that I trust plus all their range had a small discount! It would be rude not to! Before deciding on the scrub I was a little torn between that or the normal face wash. What tempted me more to the scrub was that it targeted blackheads more and I thought the tiny exfoliating beads would help clear out the dirt and oil out more and after a few uses, I could see that I was right. Even after the first wash, I could already start to notice a difference in the way my face felt. It was a lot softer and felt a lot drier (trust me, it's a good thing for someone with oily skin!). Luckily for me I had a bad cause of acne before starting using this wash and I did notice that it did help shrink the size and heal the skin a lot quicker than if I'd have just left it. Definite plus! Overall I'm really happy that I chose to pick this beauty up and I'd definitely repurchase when it runs out. If you do suffer with oily skin or just have lots of bad breakouts, I would suggest this wash as it's made such a big difference to my skin! The scrub is on sale at Boots, Superdrug and most big supermarkets for around £5.99. Bargain! This sounds great! I don't have super oily skin but I'm prone to blackheads so I might give this a try. This sounds like it worked for you which I am glad about. I have drier skin and I use neutrogena but I don't know how i feel about it really. I always love scrub cleansers! They really do clear up my skin! Such a bargain for a great product! Great review!